Dear Alan, I can't thank you enough for the wonderful performance you gave at Julie's 6th birthday. Even the grandparents felt thoroughly entertained. Julie still talks about her big moment of becoming a magician and producing Milky Way your wonderful rabbit. 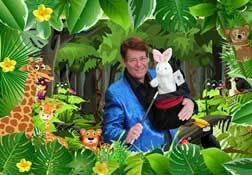 Hi Alan, Thank you so much for doing your amazing magic show at my sons 5th Birthday. It was a great show, and everyone loved it. Also thanks for the cool balloons and DVD. Our daughter Jenny has already asked us if you can come to her birthday. Thank again for making John's birthday so special. I will be ringing you early next year to book you for Jennys birthday. Hi Alan, Thank you so much for making my daughter Jennifers party so special. A week later she is still talking about your show. I will highly recommend your show to my friends and my husband has suggested that they book you for his companys family Christmas party this year.